The Console Setup menu can be accessed from within the FreeNAS® GUI by typing /etc/netcli from Shell. The Console Setup menu can be disabled by unchecking the Enable Console Menu in System → Settings → Advanced. 2) Configure Link Aggregation: allows creating a new link aggregation or deleting an existing link aggregation. 3) Configure VLAN Interface: is used to create or delete a VLAN interface. 4) Configure Default Route: is used to set the IPv4 or IPv6 default gateway. When prompted, enter the IP address of the default gateway. 5) Configure Static Routes: prompts for the destination network and gateway IP address. Re-enter this option for each route needed. 6) Configure DNS: prompts for the name of the DNS domain and the IP address of the first DNS server. When adding multiple DNS servers, press Enter to enter the next one. Press Enter twice to leave this option. 8) Reset to factory defaults: to delete all of the configuration changes made in the administrative GUI, select this option. Once the configuration is reset, the system will reboot. It will be necessary to use Storage → Volumes → Import Volume to re-import any volumes. 9) Shell: starts a shell for running FreeBSD commands. To leave the shell, type exit. 10) System Update: checks for system updates. If any new updates are available, they are automatically be downloaded and applied. This is a simplified version of the Update option available in the web interface. Updates are applied immediately for the currently selected train and access to the GUI is not required. For more advanced update options like switching trains, use Update. 11) Create volume backup: backs up the FreeNAS® configuration and ZFS layout, and, optionally, the data, to a remote system over an encrypted connection. The remote system must have sufficient space to hold the backup and be running an SSH server on port 22. The remote system does not have to be formatted with ZFS, as the backup will be saved as a binary file. When this option is selected, it prompts for the hostname or IP address of the remote system, the name of a user account on that system, the user account password, the full path to a directory on the remote system to save the backup, whether to also back up all of the data, whether to compress the data, and a confirmation to save the values. y starts the backup, n repeats the configuration, and q quits the backup wizard. If the password is left empty, key-based authentication is used instead. This requires that the public key of the root user has been stored in ~root/.ssh/authorized_keys on the remote system and that they key is not protected by a passphrase. Refer to Rsync over SSH Mode for instructions on generating a key pair. 12) Restore volume from a backup: restores from an existing backup created with 11) Create volume backup or System → Advanced → Backup. It prompts for the hostname or IP address of the remote system holding the backup, the username that was used, the password (leave empty if key-based authentication was used), the full path of the remote directory storing the backup, and a confirmation that the values are correct. y starts the restore, n repeats the configuration, and q quits the restore wizard. The restore indicates if it can log into the remote system, find the backup, and whether the backup contains data. It then prompts to restore FreeNAS® from that backup. Note that if y is pressed to perform the restore, the system will be returned to the database configuration, ZFS layout, and optionally the data, at the point in time when the backup was created. The system reboots after the restore completes. The backup and restore options are meant for disaster recovery. If you restore a system, it is returned to the point in time that the backup was created. If you select the option to save the data, any data created after the backup was made will be lost. If you do not select the option to save the data, the system will be recreated with the same ZFS layout, but with no data. 13) Reboot: reboots the system. 14) Shutdown: halts the system. 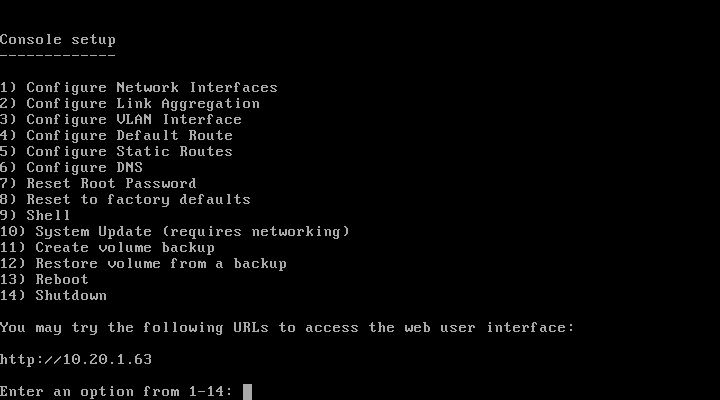 During boot, FreeNAS® automatically attempts to connect to a DHCP server from all live network interfaces. If it successfully receives an IP address, the address is displayed so it can be used to access the graphical user interface. The example in Figure 3.1 shows a FreeNAS® system that is accessible at http://192.168.1.119. If the FreeNAS® server is not connected to a network with a DHCP server, use the console network configuration menu to manually configure the interface as seen in Example: Manually Setting an IP Address from the Console Menu. In this example, the FreeNAS® system has one network interface, em0. Enter the password chosen during the installation. The administrative GUI is displayed as shown in Figure 3.2.2. If proxy settings are enabled in the browser configuration, disable them and try connecting again. If the page does not load, check whether the FreeNAS® system’s IP address responds to a ping from another computer on the same network. If the FreeNAS® IP address is in a private IP address range, it can only be accessed from within that private network. If the user interface loads but is unresponsive or seems to be missing menu items, try a different web browser. IE9 has known issues and does not display the graphical administrative interface correctly if compatibility mode is turned on. Firefox is recommended. If An error occurred! messages are shown when attempting to configure an item in the GUI, make sure that the browser is set to allow cookies from the FreeNAS® system. This blog post describes some applications which can be used to access the FreeNAS® system from an iPad or iPhone. The first time the FreeNAS® GUI is accessed, the Wizard starts automatically to help configure the FreeNAS® device quickly and easily.